When SSRN was founded in 1995, the dotcom boom was just beginning and the worldwide web was just a few years old. 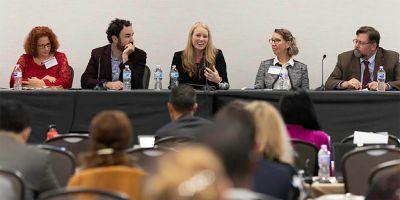 Two decades later, SSRN is at the center of a new financial technology revolution that is transforming our banking, investment and currency systems. Fintech-related preprints and early-stage research is now the fastest emerging research topic on the platform. 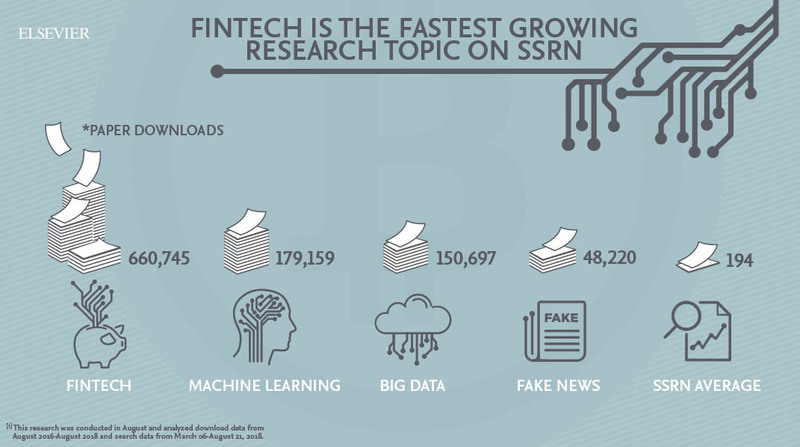 Fintech-related preprints and early-stage research papers received over 550,000 paper downloads in the past two years on SSRN. This far outstrips other emerging research topics on the platform like big data (under 160,000 papers downloaded) and the controversial subject of ‘fake news’ (under 50,000 papers downloaded) in the same time period. 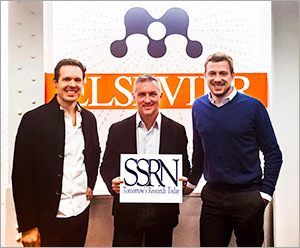 Acquired by Elsevier in 2016, SSRN is an open-access preprint community providing for academia and government. Fintech refers to financial technology, a growing industry that uses technology to support activity and efficiency in finance. 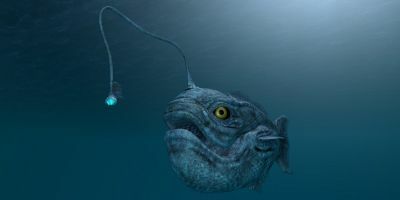 For example, the technology that allows you to use your mobile phone for internet banking stems from this industry, as does the ability to convert your money from one currency to another on the same device. 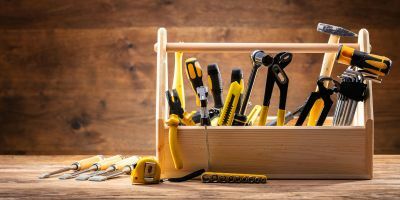 Fintech also covers a wide range of activities that the day-to-day consumer may never be aware of, such as investment services and cryptocurrencies. Overall, the industry combines technology and innovation with the aim of improving financial services for the public and organizations. As such, it has a tremendous influence both on our daily lives and on the functioning of national and global economies. Interestingly, researchers based in North America led the way for fintech research, accounting for 43 percent of the 1,468 related papers uploaded to our site, while European researchers uploaded the most blockchain related papers, with 45percent of the 653 papers on this topic. North American researchers took the lead over Europe in cryptocurrency related research, accounting for 50 percent of all Initial Coin Offering (ICO) papers, compared to 40 percent in Europe. The findings show what many of us working at SSRN already know: that preprint servers provide some of the most fascinating insights into the future of research, and by extension, broader societal trends. 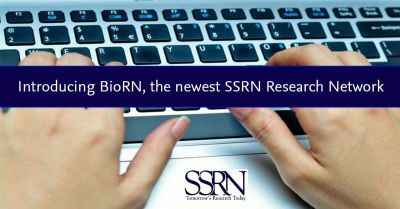 With more researchers than ever looking for emerging research on these revolutionary technologies, SSRN enables academics to quickly access, read and collaborate with fellow researchers, accelerating understanding across all scientific disciplines. Fintech research is undoubtedly in a league of its own in terms of growth on the site. 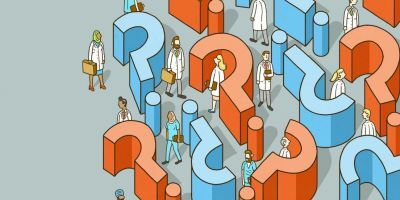 In the past two years, no other areas of research have matched the rapid growth of topics like bitcoin and blockchain. Given the complexities around blockchain, it is perhaps not surprising that that the most popular fintech-related paper on SSRN is one that explores “Some Simple Economics of the Blockchain.” This paper alone has been downloaded more than 23,000 times since it was uploaded in November 2016. SSRN has created a dedicated page for the Top 10 most downloaded fintech related papers, which are free to read and download. 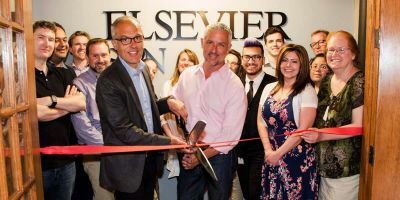 This is one of the benefits of the SSRN platform; as one of Elsevier’s open access platforms, it enables researchers to submit papers for free, and the content is downloadable, at no charge, from anywhere in the world. 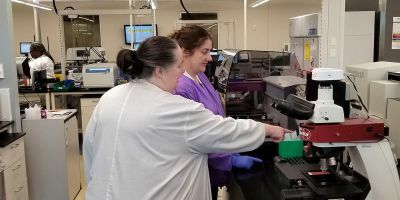 Not only are we able to contribute to the development of established areas of research, we are also helping the world’s brightest minds map what our future lives might look like and how the world will do business. If I look back to when we started SSRN in 1995, at the beginning of the age of the internet, I would not recognize the world as we now know it. I am genuinely excited that SSRN is at the forefront of scientific discovery in some of the world’s most cutting edge technological and social advances. I can’t wait to see where the next 23 years take us.